Being four-time world champion must mean something, even if the four titles are from Group N championship and even if Trelles effectively was the only driver that drove full series. The big star from southern America is unquestionably Jorce Regalde but in 1990's it was Trelles that was most followed driver from the region. An old story says that Gustavo was works driver starting from his first rally. Apparently local driver fell ill before a rally and team was about to withdraw the entry but decided to allow then young Gustavo to drive. He eventually finished second and was hired as Fiat works driver in Uruguay for 1975. About ten years and seven national titles later, Gustavo ventured to Spain to further his career. Reason for choosing Spain was mainly language but he also had some friends there. His success in Spanish gravel championship was so good that eventually Lancia Spain hired Gustavo as their works driver. Expanding programme from just national series to some international and even WRC events, it soon became apparent that without miracle there would be no chance to get works Group A car. And without one success was impossible. That is why Trelles moved to Group N in late 1980's where he has remained ever since, driving first the Lancia Integrale but later migrated to Mitsubishi Lancers. 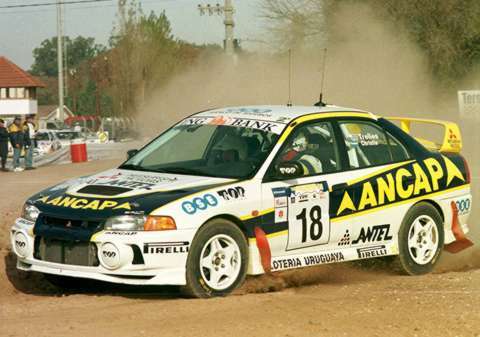 Trelles on his way to Group N win in 1998 Rally Argentina.